This is really cool, though I bet it would be pretty hard to actually tell the time with it. 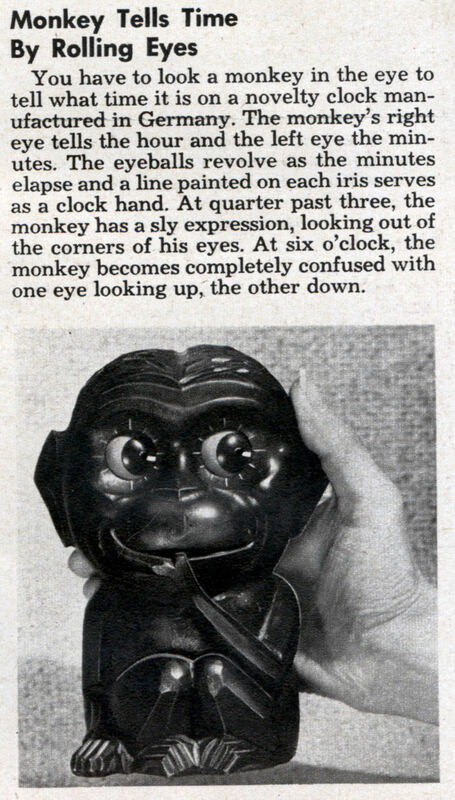 You have to look a monkey in the eye to tell what time it is on a novelty clock manufactured in Germany. The monkey’s right eye tells the hour and the left eye the minutes. The eyeballs revolve as the minutes elapse and a line painted on each iris serves as a clock hand. At quarter past three, the monkey has a sly expression, looking out of the corners of his eyes. At six o’clock, the monkey becomes completely confused with one eye looking up, the other down.